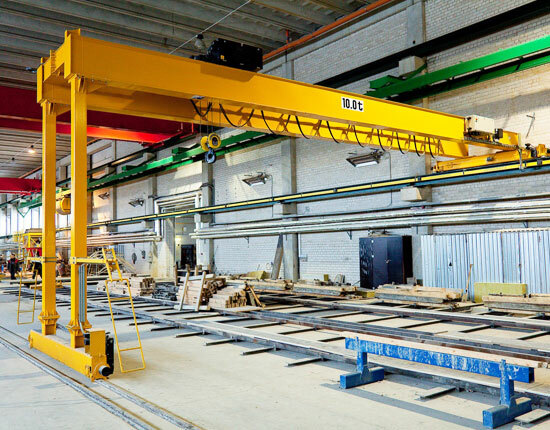 10 ton gantry crane is a popular lifting solution for various indoor and outdoor applications including warehouse, workshop, port, railroad, freight yard and shipyard. The gantry crane is ideal for occasions where the building is not suitable for supporting overhead crane or other lifting equipment. It runs directly on the ground by means of rails, rubber tires or wheels. 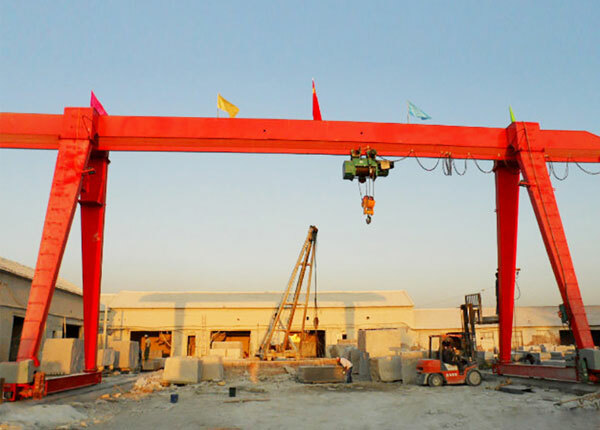 Gantry crane 10 ton is widely applied to lift and move small and medium sized materials. With respect to different lifting needs and working environments, we supply a variety of 10 ton gantry cranes. 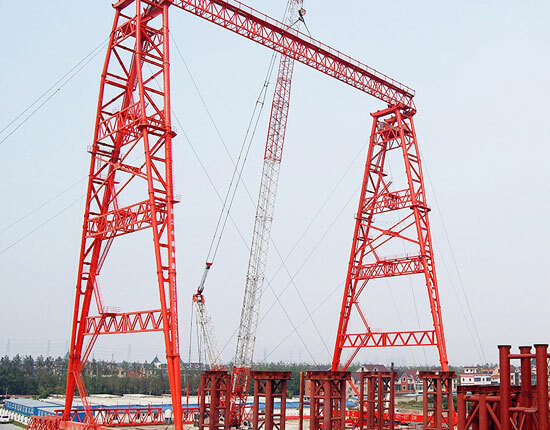 The gantry cranes can be divided into rail mounted gantry crane and portable gantry crane according to the way it moves, single girder and double girder gantry crane according to the number of bridge beam, full type and semi gantry crane according to the type of supporting legs. In addition, our 10 ton crane is available in fixed or adjustable height and span designs to fit different occasions. For 10 ton lifting requirement, we supply many different types of 10 ton gantry cranes to fit a variety of fields. They can be constructed with different models, sizes and frames on your requests. 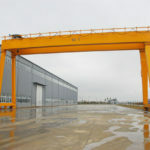 Before choosing a gantry crane 10 ton, you need to consider a few things including the span, lifting height, the type of gantry frame, the size suitable for work space, and the way it moves. 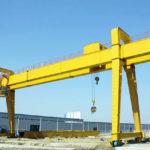 Here we recommend several models of 10 ton gantry cranes for your reference. The single girder crane is a perfect solution for small and medium lifting requirements with capacity up to 16 ton. It more often comes in A frame construction and is designed for general purposes. The MH single beam gantry crane is the most popular option for various 10 ton lifting needs. This type of 10 ton gantry crane is built with L-shape legs, making it suitable to handle large and long items. 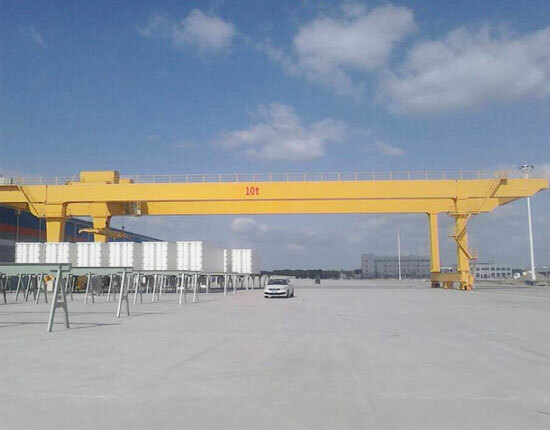 The L type gantry crane is widely used in open-air storage yard, railroad freight yard and port with numerous advantages such as simple structure, light dead weight and small wheel pressure. 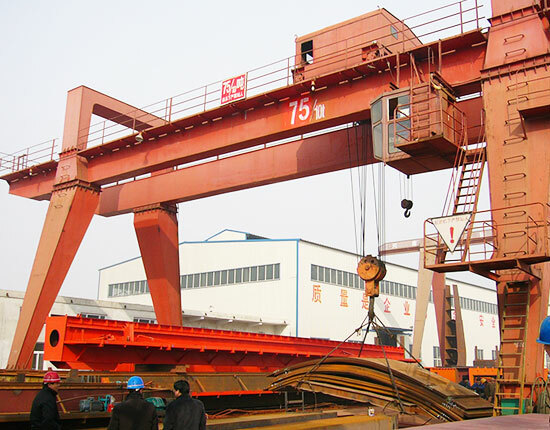 Double girder gantry crane is preferred to undertake frequent 10 ton lifting tasks. Compared with single girder crane, it has higher working level, greater lifting height and speed. The double girder type 10 ton crane is usually constructed with saddles on the main beam, allowing it to bear a reasonable force. As the name implies, this type of 10 ton gantry crane is built with U-shape legs, which increases space between the two legs, thus it is an ideal solution for handling heavy and bulky loads like containers. 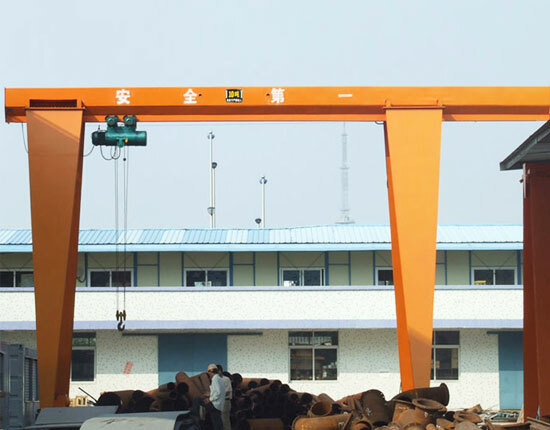 Given the same lifting height, the overall height of this U shape gantry crane is lower than A frame crane. The small portable gantry crane is increasingly popular for carrying out light duty lifting jobs thanks to its convenient movement and flexible adjustment. It is typically made of steel or aluminum with sturdy construction. Besides, fixed or adjustable height and spans designs are available. The 10 ton mobile gantry crane has many prominent features including light weight, low cost, strong mobility and high adaptability. 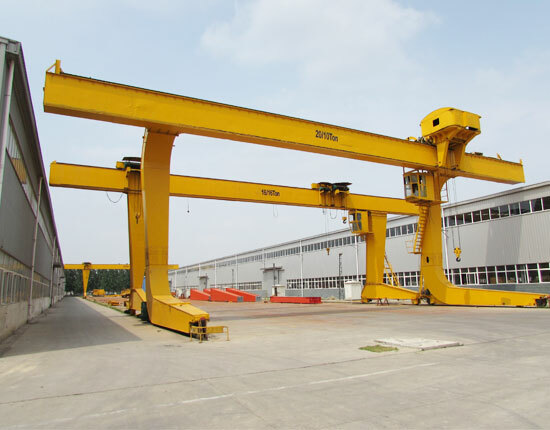 In addition, we provide some other types of gantry crane 10 ton to suit various applications, including semi gantry crane, box type gantry crane, truss gantry crane and cantilever gantry crane. When choosing a gantry crane equipment, you should specify your requirements such as 10 ton gantry crane specification, size and model so as to make the best decision. To know more detailed information about these different types, contact us online now! How Does 10 Ton Gantry Crane Benefit You? 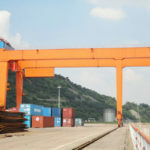 As an efficient lifting tool, gantry crane is most commonly used type in various industries such as manufacturing, construction, shipyard and railway in order to help enhance production. The 10 ton gantry crane is designed to meet small and light duty lifting requirements and brings many benefits to users. Compared with overhead crane, 10 ton gantry crane can be designed in mobile type to realize a convenient movement. The mobile type gantry crane makes it possible to be relocated in other workplaces, which is also an ideal option for rented facilities. You can choose either a fixed or adjustable type gantry crane 10 ton according to your specific lifting needs. The adjustable height design allows it to adapt for various facility heights or makes it easy to pass through obstacles. Built with solid and reasonable structure, the 10 ton lifting equipment has stable performance and prolonged working life. Our gantry lifting system is capable of handling small and heavy materials with capacity ranging from several tons to hundreds of tons. We can provide customized 10 ton gantry crane to meet special needs of customers. 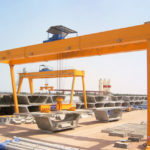 Gantry lifting equipment can lift and move heavy loads quickly and efficiently, making it a cost-efficient substitute for other lifting systems. Our 10 ton gantry crane is fabricated with sturdy structure, mainly composed of main beam, end beam, supporting legs, end carriages, hoist trolley and electric control system. For metal structure of 10 ton gantry crane, various frame designs are available such as A type, U type and L type so as to handle different materials. We keep optimizing the equipment structure to provide stable and durable performance. During machining process, we closely inspect every part to ensure quality products. 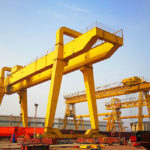 Hoist trolley is the most fundamental part of gantry crane equipment. We have wire rope hoist and chain hoist for your choice, of which the electric wire rope hoist is the most commonly used type as it can lift with a variety of capacities. However, chain hoist is a more cost-efficient solution for small lifting needs, widely used in workstation and shop. We have manual and electric chain hoists for you to choose from. For crane running mechanism, we provide both track and trackless operations to fit different applications and environments. 10 ton gantry crane, especially for outdoor uses, is equipped with many protection devices such as overload limiter, wind proof device, anti-collision device and rain cover in order to protect the electrical devices and other components of the crane. 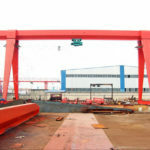 As a large gantry crane manufacturer and supplier in China, we have a wealth of experience in gantry crane design and fabrication. 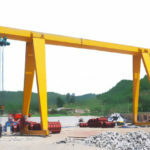 We supply a large variety of lifting equipment to serve customer’s needs, mainly including overhead bridge crane, gantry crane, jib crane, hoist and winch products, many of which have been exported to more than 80 countries and regions. We always take the satisfaction of clients as a top priority, and work hard to provide quality products and best services they need for their businesses. Besides, we have an experienced team of experts to provide technical support and solve problems for you. We are committed to providing superior quality products and favorable prices for customers. If you have any need for 10 ton gantry crane, contact us online directly, and we will help design the most appropriate solution for you.